This article is geared towards those who have short lesson times, whether in Rotation or a Traditional Sunday School, and who don't want to sacrifice quality or creativity. Sometimes "too short" is temporary due to an overrun or change in the Sunday morning schedule. Sometimes "too short" is simply because the church's schedule doesn't permit you to have enough time with the kids. And sometimes, "too short" is the result of poor classroom management or preparation, or issues in the classroom. This article offers help for each type of shortened lesson time. What is the "optimum" length of a Sunday School class? In a recent survey at Rotation.org the consensus was about 45 to 60 minutes. That's also the amount of time many lesson plans assume you have. This means that if you regularly have less than 45 minutes, you often need to adapt lesson plans, or stay away from those that are more involved. Like Goldilocks, you search for lessons that are "just right" for your situation. A Bible study and discussion that takes half of class --leaving you with 10 minutes for aa quiz game. Such scenarios leave you with little time to chat with your kids, and do reflection. Under 30 minutes, you are focused on "getting everything done" rather than promoting fellowship, creativity, and a relaxed learning atmosphere. One common and unfortunate strategy for adapting is simply "avoidance" of certain types of activities.But almost any lesson plan can be the "right one" regardless of how much time you have, IF you learn a few adaptation tricks, it is taught well, and you make every minute count. Below are ten ways to adapt a longer lesson into a shorter lesson time. Feel free to "reply" to this post to add more! 1. If the lesson time gets short-changed this week, the kids will be learning the same lesson over a four or five week period, so they don't miss out on key stories. 2. The workshop teacher LEARNS how to adapt their lesson to a short lesson time because they get to try it again each week for a new group. 3. Workshop teachers get comfortable and experienced at teaching in their workshop's medium. Thus, they have all the materials at hand in the workshop, know how to quickly access and use them (such as how to run the video player or use the drama and art supplies). They know how to prepare their materials in advance to save time, and don't need to prepare a brand new lesson every week because they are repeating their lesson in rotation. If you have a Traditional model Sunday School (which teaches a new story each week), and you're always out of time, you should seriously consider AT LEAST moving to a 2 week lesson 'rotation' so that your kids can come back the second week and continue your creative lesson with you. See a few more notes about that at the end of this article. Whether you're teaching in a traditional or Rotation Model Sunday School, here are some basic do's and don’ts to adapt all types of lessons. They are great tips for ALL teachers, no matter how long your lesson time is. Later in this article we'll make some "workshop-specific" suggestions. 1. Get Help and Utilize Your Volunteers! Make sure your helpers arrive early to help with prep, understand the need for brevity, and know your lesson plan. Help them understand their role as a facilitator, ...someone who greets late arrivers, helps stragglers catch up. Let your helpers deal with disruptions. The Lead Teacher needs to stay focused on teaching. 2. Focus your lesson activities on the central point of the Bible lesson and cut any discussion and activities that don't focus on that point. Avoid sacrificing the Bible message and class time to busy-work and "fun" that has no teachable moment. Creative techniques and activities should be focused on the Bible story. 3. Shorten the Bible passage to its essential verses. Some stories are long and you need to focus. "Less is often more" when it comes to learning and remembering scripture. 4. Do more advanced preparation. Have all equipment set up, turned on, and ready to roll. Many creative lesson plans will be within reach if you have the supplies ready to go, and certain time-consuming steps taken care of in advance. This includes having notes about what part of a video or drama script to "skip" when pressed for time. Salvaging a minute here and there by advance prep and pre-staging returns precious minutes to teaching. 5. Make your point at the beginning of the lesson, not the end. The summary or reflection is often a rush job in a shorten lesson. Stating the "take away" will also focus you and your helper's comments and questions. This is good advice for all teachers and lessons. 6. Break into smaller groups. Small groups often require less management and are easier to get going on a project than having to deal with a large group. This is where having shepherds (teaching assistants) is essential. They need to know what to do as soon as they group up. 7. Use "arrival time" to put students to work getting ready for the lesson. For example, if you're going to do a skit, have them put on costumes as they arrive before your study begins. An early arriver can bookmark passages for everyone, start in on the opening activity and instruct others students (such as, "listing every Beatitude we can remember"). 8. Look for lesson plans that are vividly memorable. In a short lesson time, kids have less time for memory formation. Thus, you want to pick lessons with highly memorable lesson activities so that the lesson continues to do its teaching after class is over. Shorter lesson times need to leave a strong impression, and not just be a quick read and discussion. 9. Do not take up too much time doing all the talking. Learning is not merely listening. Avoid or adapt lessons that rely too much on the teacher's exposition (lecturing). Make sure your questions and points are concise, and keep it moving. Better yet, make sure the activities are memorably reinforcing your point. 10. Examine issues and correct practices that are stealing vital minutes from your lesson time. Every minute counts when you only have 30! See the list below for more suggestions. "Time stealers" can be bad habits (teachers and students), disruptive or clueless but well-meaning individuals, as well as, poor planning, lack coordination, and simple lack of awareness on the part of leaders outside your program. Leaders should highlight key points and questions in lesson plans, so that teachers aren't fishing around for what to say or ask. You don't have time for sauntering up to the point. Later is this article we'll offer some workshop-specific tips for those teaching with our workshop lessons. Boring lessons are the biggest waste of time. is better than a 45 minute snooze-fest. It can be frustrating to have your lesson shortened by someone else's time mis-management. Here are typical problems and some suggestions. 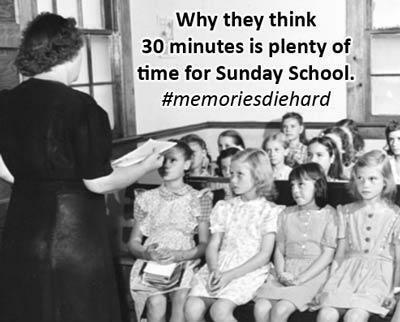 The worship service runs long, making your kids come late to class—If this is happening on a consistent basis, then you (or the Sunday School Leadership) could speak with the pastor or worship leader and let them know how disruptive this is to Sunday School. Plus, this shows a lack of respect for the efforts and time of the Sunday School volunteers. Perhaps it only happens on certain seasonal Holy Days, such as All Saints Day or during Advent. These are predictable and can be planned for in advance. However, it doesn't hurt to stress the importance of time-management to the worship team. Some people harbor bad memories of their own Sunday School upbringing, and thus, don't mind cutting your great program short. Some teachers also secretly feel this way and are satisfied "just making the kids happy." We have our work cut out for us! “Before class” activities aren’t wrapped up on time—Some churches send their kids to the classrooms during worship, or to fellowship hall for songs, and those activities can run over time. One simple solution is to send a "runner" to alert activity leaders that "class is about to begin" or "worship is about to let out," and they need to wrap things up. Sunday School opening runs late—Some programs have a "gathering time," or children's worship that can run into class time. Insist that they come prepared, start on time, and keep track of the time. And remember that it will take time for the students to get from the opening area to their workshop area. If needed, appoint a time keeper. Late arriving individuals—There's almost nothing you can do about this, other than consistently starting on time to send a consistent message. Do not "restart" the class or "sum up the lesson so far" for late arrivals. Instead, have a helper quietly bring them up to speed, and keep the late-arriver from "making an entrance." Interruptions from others looking for supplies or making announcements—Talk to your leadership to make sure they understand how important each minute is to you. Insist that interruptions be kept to an absolute minimum. Early student departures—There are few things more frustrating than a sibling or parent standing at the door, saying, "time to go." This can be especially disruptive to younger children. If it happens frequently, talk to the parent or sibling about a "silent signal" they can give you to release their student, rather than barging in and disrupting class. "Lookey Loo's"—students staring in window or through the open door because their class was let out early or they did not attend. Establish a strict policy about who may be in the hallways during class time. Insist that no classes be let out early. Cover/block distracting scenery. Know ahead of time what can be cut or condensed from your lesson plan at the last minute. Look ahead on the calendar for potential time problems and send friendly reminders to fellow teachers, leaders and the pastor to keep things tight. Report re-occurring time problems to leadership. Let them know it's important to you. Suggest solutions that save a minute here and there. Once class has started, there are often some time-wasting hazards to navigate. Advance preparation and having extra help is the single biggest thing you can do to MAXIMIZE class time and reduce the impact of time-stealers. Showing up unprepared—If you are unfamiliar with the activity or materials, time will be wasted. Being unprepared includes: being unfamiliar with the video you are about to show, not having pre-tested the recipe or experiment you are about to use. There's no way around it: the more dear your lesson time, the more you must prepare in advance. A corollary to this is making sure your supplies are out and ready to go. Nothing more frustrating than discovering someone has "borrowed" your glue, or game ball, or flipchart. Or to find your chairs haven't been returned from the church dinner. Leaders/Staff should visit each classroom in advance. Teachers need to show up early. Unruly student—This is not referring to normal developmental characteristics, especially of younger children, which might include short attention spans, still learning to “follow the rules”, etc. This situation refers to students who will not or are unable to focus and pay attention and follow classroom rules. In this case, you will want to enlist the help of your shepherd. The shepherd can help them stay focused, engage them in another activity if need be, or even step outside the room with them for a few minutes. If you are short on time and teaching alone, you simply can't be teaching alone. Interruptions from outsiders—Perhaps you have parents or siblings showing up at the door before the class time is over. Or the class next door involves some noisy activities. Or your room has supplies that other classes need. Each of these could result in students being distracted and slowing down the lesson. Remove unneeded supplies to another area. Add prominent signage to discourage interruptions. If ignored, train your shepherd to take over and quietly ask the family to step out of view until class is over. Shutting the door during class is also an option, unless that contradicts your Child Safety Policy. Another option is to simply re-arrange your classroom so that students are not looking in the direction where your visual distractions typically come from. Eliminate the practice of well-meaning people coming in to your class to make announcements. In-room Distractions —Perhaps your classroom includes toys from the preschool, or big windows that look out people walking in the parking lot, or thin walls. A strategically strung cloth or "tarp-mural" can help. A portable divider made out of PVC pipe and cloth can hide a corner full of toys or block the view to the outside. Poor time management—Do you tend to spend too much time on the opening or the main activity, and leave little time for discussion and reflection? Becoming aware of this is important, so that you can take action to pace the class better. Also, keep your eye on the clock so that you aren’t surprised. Poor understanding of "how to teach"—Talking too much. Not asking age-appropriate questions. In a short lesson time where every second counts, you don't want to waste time asking questions kids won't understand, and beating around the bush until you yourself figure out how to make your point. Lack of materials, supplies —Nothing more frustrating to discover you're out of glue or someone has misplaced the costumes, or you can't find the ball for the Bible game. Leaders need to make sure teachers are supplied, and teachers need to make sure the supplies are in order before the lesson starts. Start on time and do not restart for late arrivals. Have a large clock strategically positioned in the classroom. Set a timer for certain activities so that kids won't dawdle. Use your cellphone's timer to send you a "buzz" when you have 5 minutes left, or have your helper remind you. In the Workshop Rotation Model and the Rotation.org website, our lesson plans are designed for specific "workshop" media: art, drama, games, video, etc. It's easy to adapt a workshop lesson plan for use in a traditionally organized Sunday School, but keep this in mind: in the Rotation Model, we spend several weeks on the same story --using a different workshop each week. For traditional programs, this means that a workshop lesson may not be the "final" or "all inclusive" lesson on the Bible story you're looking to teach in just one week. With this in mind, here are some additional workshop-specific strategies that you can use in time-shortened classes. In all workshops: Control the length of the Bible story. Some Bible stories, especially those that go along for several chapters, are just too long to read word-for-word. Change how you have children help you read (slow readers can take a lot of time you may not have). Find a children’s Bible that tells the story in a more condensed fashion. If you are telling the story without a book or Bible, have it well planned out so that you don’t omit important information or take too long (which totally defeats the purpose). Focusing on a smaller number of verses often pays dividends in terms of the amount of time your video runs, or drama script needs to take, and teaching points you need to make! Less is often more. In all workshops, reduce movement and set up between workshop activities and areas. In some workshops, there are study centers and activity areas, and moving between the two can waste time as kids re-settle. Start your Bible study at the computers or in the comfy video workshop chairs. Put on costumes as students arrive for the drama workshop, and then conduct your study so you don't have to waste valuable time on set up. In all workshops, incorporate the reading/hearing of scripture in the activity, rather than thinking of it as "the thing you read before the activity starts." Especially where short lesson times mean less learning activity time, you do not want to be a slave to the belief that "it's only scripture if it is read from the book." Your scripture can be presented by the video or software. It can be the text of your drama or told by the ingredients of your cooking. It can be the story your kids dive into to answer your game questions. This is not to say "don't read," rather, this is simply to say there are many ways the Word can be taught. Have the video in the player and already forwarded past the introductory stuff before class starts. Make sure the machines work—both video and audio. Use that fast forward or skip-scene button! Know what to skip. Pause to point things out during the video, rather than waiting for it to be over. All these things are do-able if you have previewed and outlined what you're going to show. Leaders: make sure your teacher understands how to fast-forward or skip chapters using the remote. Have the popcorn already in bowls. Many Rotation lessons include more than one game, so the easiest option here is cutting out a game. As well, you can ask your shepherd-helper to help you quickly organize the kids into teams, and help kids play the game per your instructions. Reduce any or all of the following: the number of questions, steps, distances traveled, # of teams. When possible, include the scripture reading in the game to save time. Have your supplies ready and set out before class starts. There are often some “non-creative” steps in the project that you can prepare in advance. Make your teaching points WHILE students are working on their project; sometimes those discussions flow more naturally and can even be more pertinent and personal. The projects might not have time to set or dry, so let the kids know that they will have to pick them up the next week. Look for materials and glues that don't require much drying time. Have a hair dryer or fan ready. Mess-prep the room and kids before the lesson starts. Start the computers and the program ahead of time so you don't have to waste time watching the software load. Write important instructions on the board before class. Talk with the students while they are working on the computer, not just when you are wrapping things up at the end. But keep in mind that some software games simply require X amount of time. Preview them to be sure. Look into the program's features/options to see if you can skip things. Be ready with "cheats" that help students complete software game challenges to save time. Have ingredients ready and perhaps even pre-measured. Use hand sanitizer in place of washing with soap and water. Change the recipe to cut cooking time. Items of smaller size bake quicker (mini muffins, mini loaves). Consider foods that don't require cooking, just assembly. Start class with the first preparation steps, and conduct the "study" during baking or setting time. Reflect while you eat. Extra helpers are important too. Include teachers/helpers as actors to facilitate the drama and help students quickly get organized. Lay out the costumes and props and puppets before class begins and let them select them as they arrive. Shorten scripts. If you are going to be discussing scenes/actions/feelings/etc, then have those headings already written up on the board before class. Use a quick method to assign parts (quickly hand out slips of paper or craft sticks with the various characters written on it). If a lesson calls for creating puppets or scenery, then you might need to cut this and provide puppets and scenery (unless it is vital to the lesson that the kids create it). Have a plan for moving quickly between scenes. Some lessons have several activities/experiments, so you could choose to delete one. Have materials set up—put each experiment at a different station and have everything set up and ready to go. Worksheets can help direct the action and include some reflective questions. Shorten monologues and have a quiet signal that tells the storyteller to "wrap it up." This is why some of us like using the Workshop Rotation Model. We know we will be back at the same story the next week! And the next week's lesson is always better because we come knowing how it will unfold, what to prepare a little better for the second time around, and which parts of the lesson the kids will really sink their teeth into. Planners can create extra space on the teaching calendar to let teachers re-visit great lessons they had to skip or short on time, or want more time to teach. Don't let the tyranny of the calendar or curriculum short-change your kids Bible education. The "do-over" aspect of the Rotation Model is something many Traditional Sunday Schools could also benefit from. If your class time is regularly short, consider spending TWO WEEKS on the same story, so that you can spread out your lesson plan's activities rather than have to cut them. You can do this by simply removing some of the less-attractive lessons from your schedule to create calendar space for spending more time on lessons you identify as more important. Use Rotation.org's lesson ideas and lesson plans to facilitate SPREADING your "one week" traditional lesson plan to a second week. This will also take the pressure off your single short class time, allowing you to slow down a bit, and use the second week to follow-up, recap and re-do if necessary. We hope that these suggestions prove helpful. If you have any suggestions, please feel free to add them as a reply to this post. And if you have made an adaptation to a lesson that is already here on rotation.org, then we encourage you to post that as a reply to that lesson so that you can be helpful to one of your fellow volunteers!